We have the first photos from M. Night Shyamalan's Glass, giving us our best look at the movie yet. 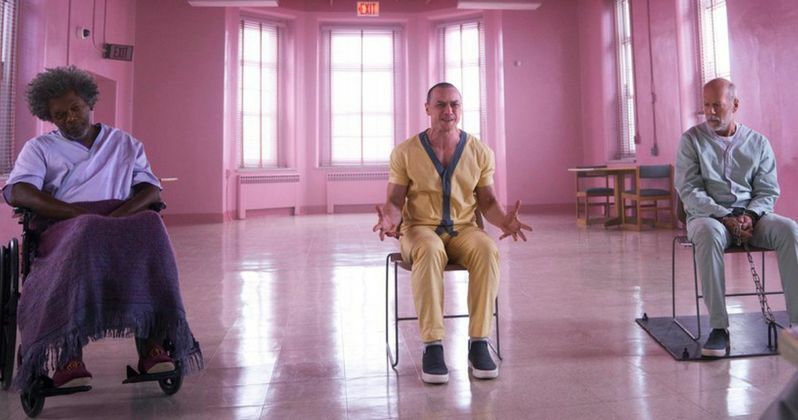 Glass serves as a follow-up to last year's smash hit Split, which, to the surprise of everyone, was a secret sequel to the filmmaker's 2001 movie Unbreakable. This will serve as the culmination of that trilogy, bringing back Samuel L. Jackson's Elijah Price, aka Mr. Glass, and Bruce Willis' David Dunn, who had a brief cameo at the end of Split. These first photos promise something fans have been waiting a very long time to see. One of the shots features Elijah Price in his wheelchair decked out in purple from head to toe. There's one of Sarah Paulson's psychiatrist character, who "deals with people that think they're comic-book characters". It's kind of the modern-day equivalent of 'I think I'm Jesus' or 'I'm an emperor,' says Shyamalan. We also get a glimpse of Anya Taylor-Joy reuniting with James McAvoy's Kevin Wendell Crumb, aka The Beast. By far the most amazing shot features the trio of Dunn, Crumb and Price in a massive room being interviewed by Paulson's character. The room is drenched in light purple and looks nothing shy of incredible. James McAvoy turned in one of his best performances ever in Split by showcasing a host of different personalities. McAvoy teases that "We get to spend some time with some new people that live inside Kevin" during the events of Glass. He also reveals that, while filming Split, he had no idea it was connected to Unbreakable at all. "We were chatting and he said, 'Well, maybe if this one does well, we'll do another one. I was like, 'Really? We're going to do a sequel to Split?' He was like, 'Yeah, you know, bring back David and all that.' And I was like, David? Oh, wait a minute..."
M. Night Shyamalan also reveals that Charlayne Woodard, who played Elijah's mom in Unbreakable, and Spencer Treat Clark, who played David's son, will also appear and that "[They] play a big role." These first images and this new information should do more than enough to get people excited about what's in store, if they weren't already. We were recently treated to seeing the first poster for Glass, which is equally impressive. This is easily shaping up to be one of the most highly-anticipated sequels of 2019. Universal and Blumhouse are bringing a presentation for Glass to San Diego Comic-Con and that's where we're likely to see the first trailer, which was shown at CinemaCon earlier this year to rave reactions. We'll be sure to bring the trailer to you as soon as it's made available online, which should hopefully be right after it's shown at the event next weekend. Glass is set to arrive in theaters on January 18, 2019. Be sure to check out the first photos, courtesy of Entertainment Weekly, for yourself below.